Are you interested in remodeling a bathroom in your Frisco, Texas, home? If so, allow the skilled experts at Star Home Remodeling to transform your outdated bathroom into the space you’ve always dreamed of having. 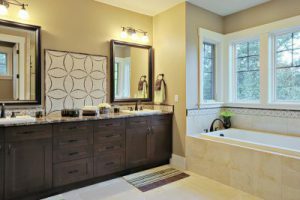 We can renovate your bathroom by upgrading the room with a new shower or bathtub, flooring, lighting fixtures, tile, vanities, cabinets, countertops, mirrors, plumbing fixtures, and so much more. Plus, as a full-service home improvement company, we can handle every aspect of your renovation, ensuring you don’t have to work with multiple companies and different schedules. Our talented team can even help you select the perfect custom products you’d like to incorporate into your bathroom remodel. For instance, we can provide you with a modern soaking tub, custom cabinetry, and virtually any other item you’d like included in your bathroom renovation. What’s more, you can rest assured only highly experienced technicians will handle the installation process for you. Our team will stop at nothing to ensure you are totally happy with the work that we complete and will go above and beyond to bring the vision you have for your new bathroom to life. For more information about the bathroom remodeling services we offer to homeowners throughout the Frisco, TX, area, contact Star Home Remodeling today. One of our friendly and knowledgeable customer service representatives will gladly answer any questions you have and schedule you for a consultation at our showroom or your home.